You are here: Home / Uncategorised / How do regular people afford to travel the world? How do regular people afford to travel the world? That’s the question I set out to answer when I started Nomad Wallet. You can rely on your savings alone to pay for your travels. This is great if you’re going on a trip with a fixed end date, whether it’s a two-week vacation or a year-long round-the-world trip. All you need to do is figure out a travel budget and then save like mad. There is no right or wrong way to save money; it really depends on your personal situation. What works best for me is saving on my three biggest expenses and cutting back on subscriptions and other recurring expenses. If you want to travel full-time indefinitely, savings alone will not be enough. Eventually, you’ll run out and have to go home. But the money in your savings will support you in the first few months or so. Meanwhile, you can figure out how to earn money as you travel — which, incidentally, is what I’m covering next. This is the way to go if you don’t have much cash saved up now. Secure some sort of income stream and, if it’s enough to cover all your expenses, you can travel forever! Okay, this is not a way to earn money as you travel, but you could still do a lot of traveling even if you have a 9-to-5 job. If you’re smart and strategic with your time and money, you can travel for a few weeks every year and visit quite a lot of places. Check out how other travelers manage to travel to multiple countries every year even though they have full-time jobs. If that’s not enough traveling for you, you can take a career break for an extended round-the-world trip. Maybe traveling full time for a year would be enough to scratch that itch. If that still doesn’t do it, you can alternate between working and traveling — work full time for 1 year, travel the next year, then rinse and repeat for as long as you want. These travelers are doing just that. Travel is a built-in part of some jobs, such as working on a ship or as a tour guide. If you don’t mind doing some seriously hard work in hospitality, this is a great way to get paid to travel. Get a job at your travel destination, enjoy a stable income and explore the area in your free time! There’s a lot of demand out there for English teachers and you don’t always have to get any teaching certification or experience beforehand. Many travelers also take on hospitality jobs, such as working at restaurants and hotels. If you like hanging out with kids, working as an au pair is a good option — you’ll get free food and lodging on top of your paychecks. And you can always work in your current field, only in another country. If you can’t find a job, create your own job. Some travelers have great success editing English menus at restaurants, teaching English as a private tutor, busking or selling their artwork at local markets. Think about any skills that you can market. Check out some of the jobs other travelers have. When you only need a laptop and Internet connection to earn money, you can work from anywhere in the world. If you’re really lucky, you may be able to get your current employer to agree to let you “work from home”. Lots of parents have such an arrangement at work. It’s worth a try — the worst your boss can say is no. Alternatively, you can work as an online freelancer. Think about how you can translate your skills into something you can sell online. For example, you can work as a writer, graphic designer, programmer or virtual assistant. My accountant does a lot of his consulting work over Skype and there’s even a woman who does bra-fitting over Skype! There are many opportunities on the Internet if you’d only get creative. Read about how other travelers earn money online. With passive income, you can travel without having to worry about going through your savings or finding work. It’s never going to be completely passive; you may have to do some maintenance work from time to time, but it’s not like you have to show up for work every day. And it takes a lot of work upfront, but once you set it, you can (mostly) forget it! You can create passive income through rental properties, a portfolio of dividend-paying stocks or a business that can run on its own. Internet marketers like to say that they have passive income through their websites, but this is not as easy or passive as they’d want you to believe. Learn how passive income is possible for real travelers. Work exchange arrangements usually involve you doing some work in exchange for getting free accommodation and/or food. A lot of these gigs involve farm work and hospitality work. You won’t earn any money, but who needs money when you can live off free stuff? See what kind of unpaid gigs other travelers take on. When you travel, your biggest expenses are transport and accommodation. Depending on your travel style, there are different ways to cut your costs. If you’re in the U.S., it would be a big waste to not take advantage of frequent flyer miles. Residents of Canada and the U.K. can do this too, to an extent. Just by signing up for credit cards, you could get free flights! Travel hacking can get really complex, but you can always start small. Signing up for just one good credit card might get you enough points to fly for free. Check out this post to find out how to start travel hacking in four steps. You can save a lot of money on flights just by booking the right flights through the right booking website or travel agent. I usually start my search at ITA Matrix, then (because it’s just a search engine and I can’t book flights there) I go to the airlines’ websites. And because not even ITA Matrix comes up with the best prices every single time, I check two or three flight booking sites like CheapOair, Vayama and Kayak. Click here to check out my list of the best flight booking sites and coupon codes. This may seem obvious, but there are modes of transport other than flying. The most common ones are trains and buses, but there may also be local transport options like scooter taxis and tuk-tuks. If you prefer to travel by car, it’s a good idea to compare rental rates — flight booking sites can often do this for you. And there are ways to travel cheaply by car, too. Hitchhiking is free, for example. But if that seems too crazy for you, you can take advantage of carsharing, peer-to-peer carsharing and ridesharing instead. Find out how to use these transport options. Collecting points works well with hotels, too. You could score free stays and upgrades at some of the world’s most luxurious hotels by using credit cards and hotel loyalty programs. Prices for the same hotel room can be different, depending on where you book. I used to check several websites before making a booking, but now I just use HotelsCombined . It saves me a lot of time because it compares hundreds of hotel booking websites at once, including Booking.com , Expedia , Hotels.com , Agoda and many more. For hostels, I find Hostelworld usually has the best prices. Check out this page for the best hotel and hostel booking websites out there. When you book a vacation rental, you book a room from the property owner, with a website acting as a middleman in the transaction. As such, the quality, variety and prices of vacation rentals can vary wildly. You can get really great deals by choosing vacation rentals over hotels, especially for long stays, because you may be able to get lower weekly or monthly rates. Check hotel rates too, though, because hotels can be cheaper in some places. Find out where to book vacation rentals. It sounds too good to be true, but there are several ways you could get free lodging. And these places aren’t always shabby either; some of them are quite spacious and luxurious. If you want to learn more about free accommodation, check out this e-book: How to Get Free Accommodation Around the World — it’s a great resource. Find out what kind of free accommodation options are available and where to find them. 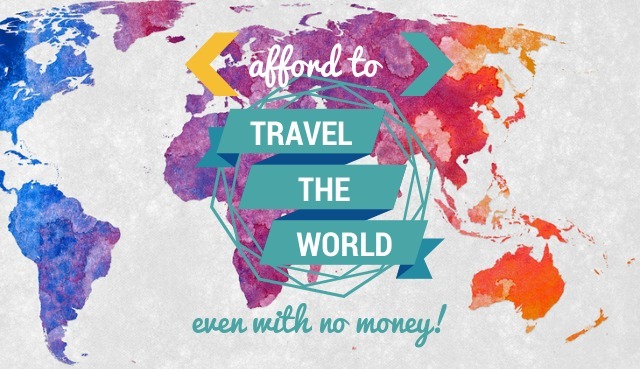 I hope this page gives you an idea of what’s possible when it comes to affording travel. I’m here for you if you want to discuss anything about affording travel. I don’t know everything there is to know about it, but I’ll try my best to help you in your journey. If you’ve found this information helpful, I’d appreciate it if you’d Like, Tweet, G+1 or Stumble this page using the buttons on the left. To learn more about affording travel, sign up to get Nomad Wallet updates delivered to your inbox and the FREE You Can Afford to Travel Too! email series. Image credit: Nicolas Raymond (CC BY 3.0 License).